Or maybe you are just frustrated with the status quo? 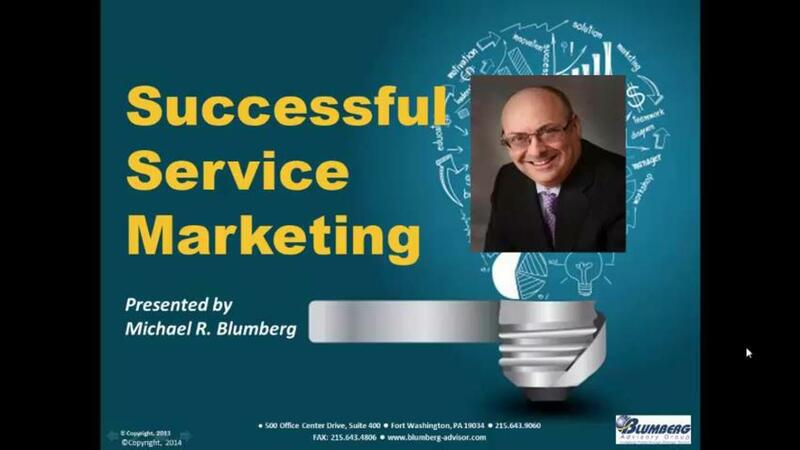 This new online course Michael Blumberg, a leading expert on service marketing, will provide you with the knowledge, insights, strategies and tools to achieve exponential growth in your company's service revenue and gross margins. Michael shares with you his over twenty years’ of experience benchmarking, developing, and modeling best practices in service marketing. He has effectively used this knowledge to implement successful growth strategies which have dramatically improved his clients top line revenue and bottom line profitability. More specifically, Michael will show you how to 1) charge a premium for your services, 2) differentiate yourself from competitors, 3) clearly articulate the value of your services, and 4) achieve exponential growth in sales and profits. Strategic Service Concepts: This lesson will introduce you to the underlying theory of successful service marketing. It will provide you with the key concepts that form the foundation of an effective strategy. The Seven Principles of Service Marketing: This lesson will examine why traditional marketing approaches do not work for companies who are selling services. Michael will provide you with a new framework called the "Seven Principles of Service Marketing" which when applied will enable you to implement an effective marketing strategy and campaign. Service Pricing: In this lesson, we’ll show you how to avoid common stereotypes by taking a strategic approach to pricing your services. You’ll also learn how to command a premium price of your services and increase revenue, profit margins, and market share. The Role of Market Research: This lesson will examine the critical role that market research plays in developing your marketing strategy, attracting the best buyers, and generating new sales. You'll learn about demographics and firm-graphics, and how they help you understand who your customers are and why they buy from you. Invisible Selling Techniques: In this lesson you will learn how to harness the power of invisible selling strategies to create demand for your services and position you and your company as the best solution to your customers' needs. Call to Action: In this sixth and final lesson, you'll learn about where your company is in its life-cycle of development, how marketing can innovate your business, help you reach the next stage of growth, and revive sales during periods of decline or uncertainty. We’ll also help you create a 90 day action plan to turn what you’ve learned into actionable and measurable results. In addition, you’ll receive a number of great bonuses like an MP3 version of the audio content, a workbook, and a power point presentation. You’ll also an e-book on how to get free publicity for your service business. This course is like getting a mini-MBA in service marketing. It is based on over twenty years of experience and 100 hours of development. We’ve put a lot of thought into the program so that you can achieve phenomenal results. Join us today on your path towards Successful Service Marketing. 30-Day 100% MONEY BACK GUARANTEE: if you don't believe that you’ve learned any new ideas that will improve your marketing efforts and increase your service revenue just send me an email within 30 days and I'll cheerfully refund 100% of your investment. * Note: Please remember to hit the "apply" button if using a coupon code. Learn how to achieve exponential growth in service revenue and profits. On-line training program teaches best service marketing best practices. © 2016 Blumberg Advisory Group,Inc.